Te Hau Tūtū has grown over the years out of discussions within the Independent Māori Theatre collective Te Pūtahitanga a te Rēhia which was founded by Independent Māori Theatre practitioners based in Wellington NZ. The vision of Te Pūtahitanga a te Rēhia was to reconnect a very disparate Māori Theatre Industry within the Wellington region by rebuilding communication and trust within the community, to manaaki, tautoko, and mahi with one another. Together, they advocated for fair opportunities for Māori practitioners in the industry; established platforms for their work to be seen, and supported Māori theatre practitioners producing Kaupapa Māori inspired Theatre in Wellington. From this unity they continue to inspire unity within the Māori Theatre industry throughout Aotearoa and the World. Te Pūtahitanga a te Rēhia Collective was founded in 2013 by: Hāpai Productions (Tanea Heke and Nancy Brunning), Tawata Productions (Miria George and Hone Kouka), Te Rakau Hua o te Waotapu (Jim Moriarty and Helen Pearce-Otene), Tikapa Productions (Jamie McCaskill and Kali Kopae), Aneta Pond, Erina Daniels, Moana Ete, Tanemahuta Gray, Tola Newbery, Vicki-Anne Heikell, Rangimoana Taylor, Riwia Brown, and Apirana Taylor in Wellington, Aotearoa. Tikapa is committed to producing Māori stories and working towards a global indigenous voice with indigenous theatre companies around the world. We are an independent Māori Theatre company based in Wellington and was formed in 2011 by Jamie McCaskill and Kali Kopae. Tikapa have produced shows such as Manawa, The Moa Show, Not in our Neighbourhood and The Biggest and are also the team behind the popular Māori showband, The Māori Sidesteps. After some years acting away, Erina decided to up-skill herself at Toi Whakaari, graduating in 2003 with a BA in acting, and then later on with an MA in Directing. Erina enjoys working on good projects with good people. Some of her work highlights include collaborating on songs for 'Hinepau' (Capital E); collaborating as a vocalist in the Taonga Puoro ensemble 'Reo' led by Charles Royal; dancing h-out to Shapeshifter and Ladi6 in the opening scene of Miria George's 'And What Remains'; workshopping and then later acting in Albert Belz's 'Yours Truly'; workshopping and then later directing Mitch Tawhi Thomas's 'Hui'; delivering the only scripted dialogue in the short film ' Day Trip'; acting alongside her brother and sis-in-law in 'Run Rabbit' (NZIFF NZ's Best 2018); directing the 2018 Te Reo Maori tour of 'Hine Kihawai' to Kura Kaupapa for Taki Rua. As a director, Erina enjoys making robust, durable, enjoyable shows - enjoyable for the audience/guests and for the performers of it. 'Party with the Aunties' is still an audience feel good favourite, touring nationally and internationally since 2011; and the critically acclaimed 'Shot Bro' continues to tour throughout Aotearoa. H-J is a producer originally from Dunedin, where she began her theatre career in stage production and touring management. Highlights from this period include Children of the Poor (Dunedin and Wellington Fringe Festivals 2001/02) Jerusalem Jerusalem (Dunedin, Christchurch, Wellington, Edinburgh Fringe, Belfast and Cheltenham 2002-03) and the double seasons of Lips/See (2003) and Sweet Meats/The Takeover (2004) at Dunedin’s iconic Globe Theatre. She then spent considerable time overseas before returning to New Zealand in 2015. H-J is based now primarily in Wellington and divides her work between that of an independent producer and as co-founder of Prospect Park Productions (est. 2016). For Prospect Park she has produced, the successful premiere seasons of Hold Me (BATS, 2016) and Shaken (Short + Sweet Festival, 2016), as well as the award-winning thriller podcast, Dark Dunedin: Heaven Looks On (Beyond Words City of Literature Award in association with Dunedin UNESCO City of Literature, Dunedin Fringe 2018). Central to the kaupapa of Dark Dunedin was creating accessible audio theatre for people with disabilities and/or limited mobility and that also celebrates the nostalgia and Gothic beauty of H-J’s hometown. As an independent, H-J has worked as a producer on Breaking Ground Festival (Tawata Productions, 2016, 2017, & 2018) the Night Mechanics (2017), New Zealand Festival and Auckland Festival seasons of Bless the Child (Tawata Productions, 2018) and the 2018 Kia Mau Festival of Maori, Pacific and Indigenous theatre and dance. Other key projects included the coordination of symposium workshops for Tai Ahiahi///Tai Awatea: Curating Contemporary Maori Art (Toi Maori/Wellington City Gallery), Playmarket’s State of Our Stage Tour (2017) and The Annual BATS Summit (TABS) practitioner development weekend, (2017). New work development is a passion of H-J’s, whether working with established playwrights and practitioners or new and emerging artists. 2018 will see her producing Spring Uprising for Barbarian Productions and TABS 2018, as well as creating an emerging playwrights initiative in Dunedin with Prospect Park. Since graduating as an acting student from Toi Whakaari in 1997, Mitch has spent time developing his craft as a playwright and scriptwriter. Mitch has spent most of his life living in Wellington, and most of his plays to date – “Coupling” (1994) “Doughboy” (1996) “Take it or Leave it” (1998) “Have Car Will Travel” (2001) “Jangle”(2010) have been performed at BATS Theatre. In 2001 Mitch received the Chapman Tripp theatre award for Outstanding New play award for “Have Car Will Travel”. The Chapman Tripp award winning play “ Have Car Will Travel” was later published in 2010 by Tawata Press. In 2002 Mitch received the Bruce Mason playwrights award. In 2003 Mitch was appointed writer in residence at Waikato University. In 2010 Mitch led the Basement programme at Centrepoint Theatre in Palmerston North where he spent the year teaching Drama workshops to teenagers and wrote and directed the play “Smashed.” In 2012 his play “Hui” received the Adam NZ New play award and it was further developed and directed by Rachel House for a season in the Auckland Arts Festival at the Q Theatre in 2013 and then directed by Erina Daniels for Court Theatre in 2014. Currently Mitch is writing his new play “Pakaru” which successfully received Quick Response funding from Creative New Zealand toward a development workshop produced by Hāpai Productions in April this year (2018). Mitch weaves writing within maintaining a full time job as a proud to be high school teacher making a difference for rangatahi at Tawa College in the subject of English. He also has been freshly appointed as a Judging panel member for the Wellington Theatre Awards. Hāpai Productions provides a culturally supportive environment for Māori Theatre practitioners to feel understood and supported. We have over 25 years of industry experience an undeniable commitment and passion for theatre and have experienced the positive effect theatre can have on Māori artists and their audiences. Our philosophy on Māori Theatre develops further on from the guidance and vision of Māori Theatre pioneers such as Keri Kaa, Wi Kuki Kaa, Don Selwyn, Tungia Baker and Rowley Habib who challenged the New Zealand Theatre status quo in the 60’s and 70’s by championing for Māori led theatre productions to be included on mainstream stages. The wāhine Māori voice is important to establishing a balanced perspective of the Māori world view. Hāpai key focus is in creating more opportunities for wāhine representation on stage and behind the scenes. Hāpai offers opportunities for all Māori practitioners to learn new skills in all areas of theatre performance and production. Hāpai would like to seek out Māori who have a strong passion for design and who feel confident utilising their te reo and tikanga experience in the area of lighting, set design, sound and costume design. Hāpai is taking steps towards developing more te reo and tikanga in the working environment, through the creation of new theatre works focusing on developing these areas and by learning te reo Māori. Vision: To produce mana enhancing Māori Theatre productions whilst upholding Māori Values. Mission: Hāpaingia te kaupapa Māori me te mana Māori, mā te auaha a ngā whakaari Māori me ngā mahi a te mātauranga Māori - Upholding Māori philosophical practices, prestige and the pursuit of Māori knowledge through the creation of Māori theatre. Nancy has been involved in professional theatre since 1992. She trained at Toi Whakaari Aotearoa in 1990-1991, established herself as a theatre actor, director and dramaturge with Māori Theatre/Production Company Taki Rua Productions for well over 15 years. She has acted for theatre throughout New Zealand and has directed theatre in English and Māori. She also works as an actor and dramaturge with some of New Zealand’s most celebrated Māori Playwrights such as Briar Grace-Smith, Witi Ihimaera, Hone Kouka and Albert Belz to name a few. In 2011 she completed her first play Hīkoi which premiered at the 2015 Auckland Arts Festival. Nancy was selected as the first Indigenous NZ Writer at the Banff Indigenous Writers Residency in Canada 2014. Nancy is also an actor in Television and Film, (her latest film“Mahana” Directed by Lee Tamahori based on the novel “Bulibasha”by Witi Ihimaera) premiered at the Berlin Film Festival in February 2016. She has recorded many plays and short stories for Radio NZ, and most recently has been a casting agent and kaitautoko for Documentary/Drama film “Belief” about the tragic death of Wainuiomata resident Janet Moses. Through Hāpai Productions Nancy will take on the role of Producer/Director and Writer in their next project Portrait of an Artist Mongrel – celebrating the writing of Rowley Habib presented at this years Auckland Writers Festival. Ehara taku toa, i te toa takitahi, he toa takitini – Success is not with the work of one, but with the work of many. Tanea Heke graduated from Toi Whakaari: NZ Drama School as an actor after completing her undergraduate degree at Victoria University. 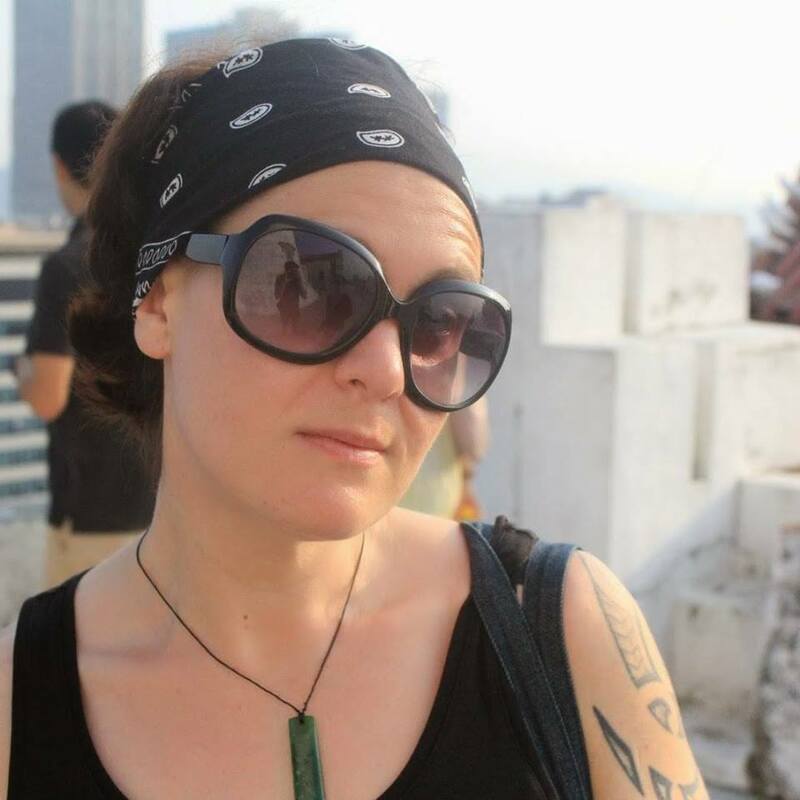 She worked at Taki Rua Productions for four years curating and producing Maori and Pacific theatre works for the domestic and international market. Works included Te Reo Maori plays which toured kura kaupapa and kohanga reo nationally and she accompanied productions to Greece, Canada and Hawaii. Most recently Tanea will be seen playing the role of Charm, in the acclaimed film WARU that is making waves internationally for its premise of bringing wāhine Māori directors, writers and characters to the forefront of film making in this country. She can also be seen in KHF Media’s (Wellington based production company) acclaimed docudrama Belief the possession of Janet Moses that is now being screened on Netflix America. While she continues to work in theatre and film as an actor and producer, Tanea has managed a number of large-scale international projects showcasing artistic and creative talent from Aotearoa at the Venice Biennale, Frankfurt Book Fair and the Festival of Pacific Arts recently held in Guahan. Joining forces with Nancy Brunning to create Hāpai Productions is an extension of the work they have been doing individually.